The innovative, weightless Givenchy Mister Radiant made-to-measure glow gel is the perfect way to build up your complexion’s luminosity in an instant. The limited edition formulation is incredibly silky and refreshing thanks to its high water content, and is suitable for all skin types due to its lovely matte finish. There’s something about the DIY mixing of products that really appeals to me, from swirling together patterned bronzers to mixing multifaceted primers. It’s so much fun to adjust and mix up your perfect colour, texture, and intensity. 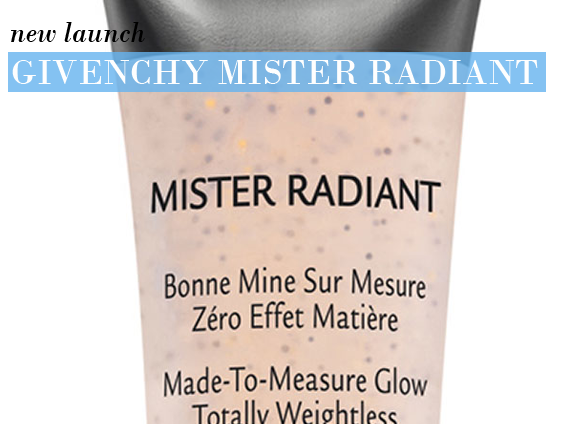 The microbeads of intense pigment suspended in Mister Radiant are coloured in pearlescent light yellow, antioxidant dark yellow, and bronzed brown which are diluted perfectly with the clear gel. Dispense a small amount into the hand, and gently work onto the skin. The pigment spheres are broken open with the heat and the movement, creating an incredibly subtle and healthy looking glow on the face. Build up the coverage for a finish that is refined and beautiful with no harsh edges, or leave it light and lovely for a ‘my skin but better’ look. The pearlescent pigments add an expensive looking sheen to the face, and the lightweight texture of the gel makes it a dream to blend and layer. Discover Givenchy Mister Radiant right here at Escentual – but be quick, he’s a limited edition! Didn't know what to expect but this gel goes on face really nicely and actually does give a glow like it says on the packet. Thank you Givenchy. I will now try your other products. This entry was posted on Thursday, June 9th, 2011 at 8:00 am and is filed under Make-up. You can follow any responses to this entry through the RSS 2.0 feed. You can skip to the end and leave a response. Pinging is currently not allowed.